Morning health update - weight is 178.4 BP is normal at an average of 122/78. I've been a little bit gassy. Probably from a Peligrino water I drank at lunch the other day. I'm very happy with my weight. It seems to have stabilized at the high 170's and that's exactly where I hoped to be in the final week. I will most likely put on about 5 pounds after this is over so if I can stay at or below 185 I will be happy. I am only working until 2 today because Debbie and I have a wedding to go to this afternoon. I was still able to take Ty out to lunch and went to the same deli as I took Jamie yesterday. Interestingly, Ty ordered the same exact thing Jamie got yesterday - without any prior knowledge of her order. And yes, again we went to Hoffman's for an ice cream. I'll be attending this facility quite a bit starting next week I can assure you. Before the wedding I wanted to get some Survivor Diet food in me in order to resist the temptation that were to follow. I made 4 fluke sushi hand rolls with lettuce and ate them right before we left. The wedding was at a really nice red church with an old pipe organ in Elberon. A couple hours later the reception was at a place in Shrewsburry called Shadowbrook. I had heard very good things about this place in the past. Typically weddings have incredible food and this might have been a good opportunity to invoke my "Special Occasion Reward" so that I could partake in the culinary delights to come. It would mean I would have to give up one of my other weekly rewards but I have two or three to potentially give up that I have not even used yet. Well, when we got there I was tempted by several things but not tempted enough to break form. That was, until I saw the ice sculptures filled with jumbo shrimp cocktail, oysters on the half shell and caviar. Hmmm. Time to invoke? 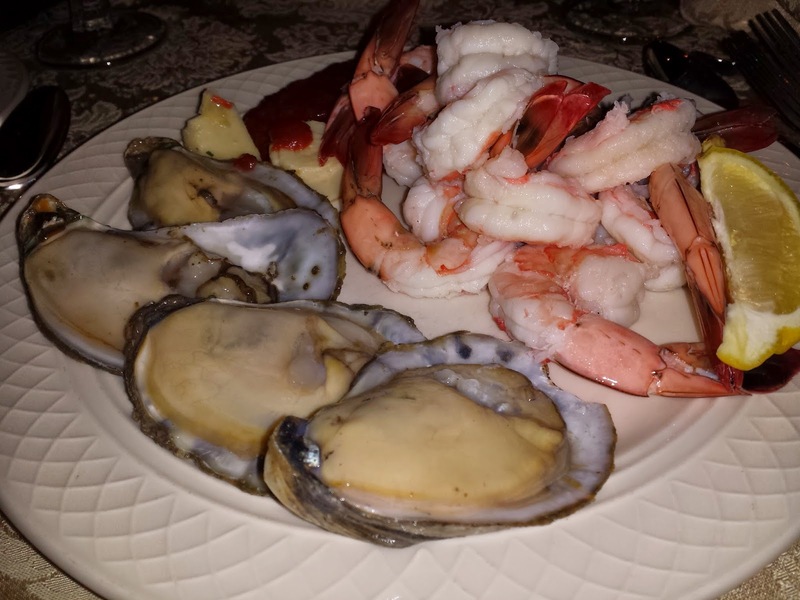 I grabbed a plate and filled it with these delicious looking seafood items and took it back to my table. However - - - I made a last second decision to NOT go off the diet despite this special occasion. Pass the water please. It was difficult to resist but I did it. I think the sushi rolls that I made prior to the wedding did the trick - just enough to fill me up so that I had the will to resist temptation. A pat on the back for me (from me).